Harvey and Gore is one of London’s oldest privately owned jewellers, founded in 1723 by two partners, Alston and Grayhurst, who opened their shop in Aldgate in the city. 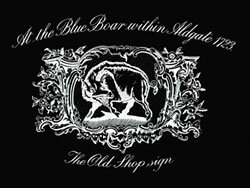 This was close to the Blue Boar Inn and the emblem of the Blue Boar was used as the shop sign. Today it is still the emblem of Harvey and Gore, forming part of our letterhead in a cartouche originally designed by William Hogarth. By 1812 the partnership had changed to Messrs. Grayhurst and Harvey, watchmakers and jewellers, who moved to new premises at 61 Strand and opened a bank account with Coutts & Co. where the firm still banks today and is one of their oldest account holders. There were several further changes of partnership and the firm finally became Harvey and Gore in 1869 when they had premises at 126 Regent Street. The Norman family have been involved since 1952 and today the firm is owned by Alastair and Sally Norman and is situated in the Burlington Arcade within 'RICHARD OGDEN’. We are members of both BADA – the British Antique Dealers Association and of CINOA – the Confederation International des Negociants en Oeuvres d’Art.